Confession #1: I’ve been known to make fun of food blogs. I wouldn’t mind them so much if they’d just get straight to the point. I don’t need a million pictures from different angles of the final product with a personal, unrelated story woven in. I don’t mind pictures demonstrating what things are supposed to look like. I’m a very visual person, so I need that, actually. Please skip the story about your yard sale find and show me what a deglazed pan looks like. I once read one that had the recipe for microwaved chocolate cake in a mug. Interspersed among the pictures of gooey chocolate overflowing from a coffee cup was a story about the blogger’s brother and how bad his feet stunk. Delish. Confession #2: I like to cook (like, not love), hate long, complicated recipes with expensive ingredients I’d only use once. I have ADD and get overwhelmed easily. If there are more than 5 or so ingredients, I’m not likely to bother. Confession #3: I found a food blog I can actually kind of tolerate and bought a kitchen gadget to make the recipes. Sorry. That last one’s a doozy, I know. Should have had you sit for that one. I was perusing the food section on the Huffington Post one day and found an entire post about noodles made out of vegetables. Turns out there’s some kind of movement or something. I found a food blog called Inspiralized. It’s run by a girl young woman whose sole focus is dishes made with this funny gadget. She’s adorable and perky and could be my daughter. She’s also single with a boyfriend, which means she makes food that serves 1 or 2. Perfect for my husband and me. Any idea how rare that is? It’s nice not to have to try and mathematically whittle down recipes that serve 6 and have ½ teaspoon of this, ¼ of that. I went to Amazon to find out more about the gadget. 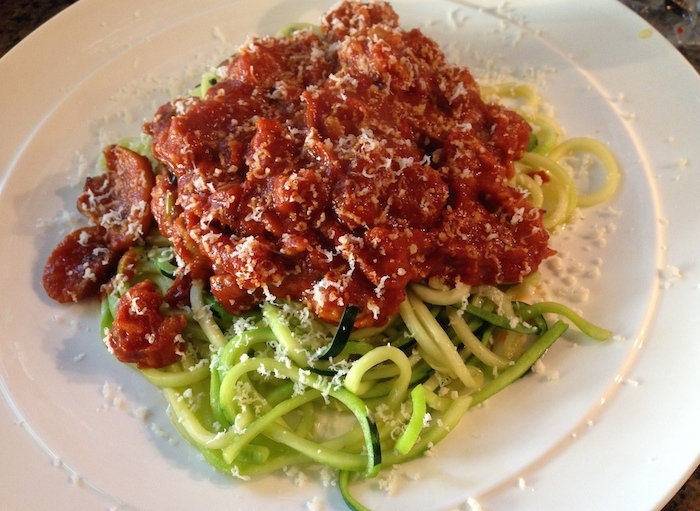 Turns out the Spiralizer is one of a gazillion veggie noodle makers on the market. Who knew? But it’s a pretty huge hit because it’s fairly inexpensive, very easy to use, and very easy to clean. I subscribed to the food blog. Here we go again. I got another gadget, got all excited, it’s collecting dust in the storage room. And then the recipe that got me spiralizing (because noodling is catching catfish barehanded) landed in my inbox. I’m a sucker for sweet potatoes, especially if they’re not covered in sugar or cinnamon. This recipe had diced pancetta, onion, garlic, basil, and red pepper flakes in it, and a giant handful of spinach at the end that you don’t even mind all that much. No kidding, we eat it once a week in my house, at this point. 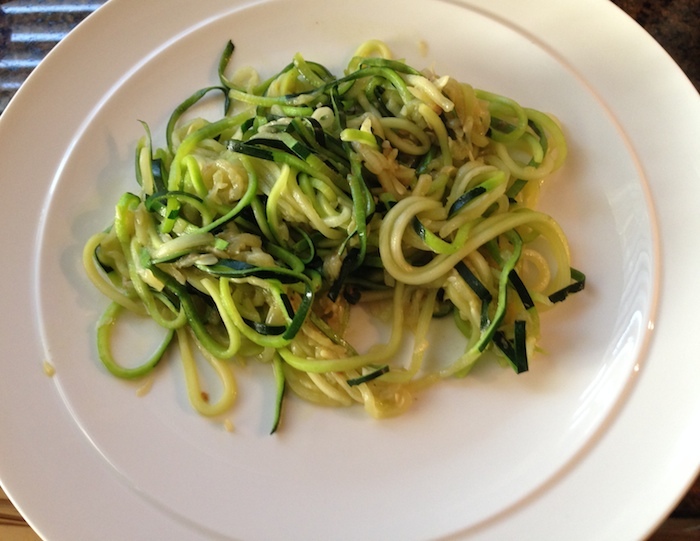 One of the vegetables that gets the most attention in the world of spiralizing is the zucchini. There’s even a cutesy poo name for it. 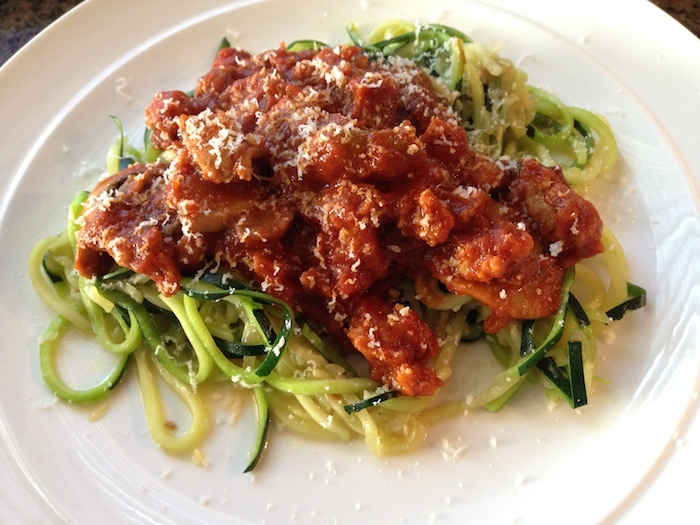 Zoodles. I’m not into cutesy. I call them zucchini noodles. I looked at the recipes on the site and realized this really is a simple thing to do. And there’s no rule that says I have to do exactly what someone else does. So I decided to make regular old spaghetti, only with zucchini noodles, instead of regular pasta. My husband and I both really liked it. If you Google these things you’ll read comments people left saying you can’t tell the difference between a zucchini noodle and a regular one. We beg to differ in my house. Even though it picks up the flavor of whatever you mix it with, zucchini still has a zucchini taste. And it’s crunchy. If the instructions say to only cook 2 -3 minutes, they’re going to be a bit more than what you’re used to for al dente pasta. But as long as you know going in it’s not really pasta, then you’re golden. Unbelievably, this post is a food blog post. I’m doing it because not only am I sharing it, I can find it quicker. When I made the spaghetti I took pictures along the way to show Desirée. I don’t have fancy lenses or filters. I took them with my iPhone. There might be steam in the way or food on the counter. Whatever. You’ll get the point. I am posting the pictures so you can see it in its various stages. This is my very own creation, by the way. I wanted to make spaghetti with my spiralizer. We’re trying to make healthier choices around here, so instead of ground beef I decided to use ground turkey. But that would mean I’d have to sauté onions, garlic, peppers, first so the turkey wouldn’t be bland. And that would mean chopping. And that would mean extra work. The solution? Spicy ground chicken sausage. Also a stroke of genius? I have a giant non-stick pan from Pampered Chef. It doesn’t require oil to brown things and, in fact, works better without oil. One less ingredient. Except I decided to toss the noodles in oil and garlic in my cast iron skillet because I don’t have a clue what the hell I’m doing. Also, since I’m on an anti-work kick in the kitchen, I used a jar of sauce. Newman’s Own, to be exact. I wanted to say I won’t tell you which flavor. I so much wanted to say it’s because I want you to use whatever you like. But that’s a bald-face lie. Truth is, I don’t remember what flavor I used. Seriously, use whatever you like. Step 1: Brown the sausage. When you do the sausage first it releases all those spices into the pan for the next thing you throw in to soak up. If you’re a “real” cook or chef, I know what you’re thinking. Shut up. I’m a real person with a real life. I will cut as many damn corners as I need to. Step 2: Open a package of pre-sliced mushrooms, dump it in, let ’em brown. Unless you don’t like mushrooms, in which case skip to #3. 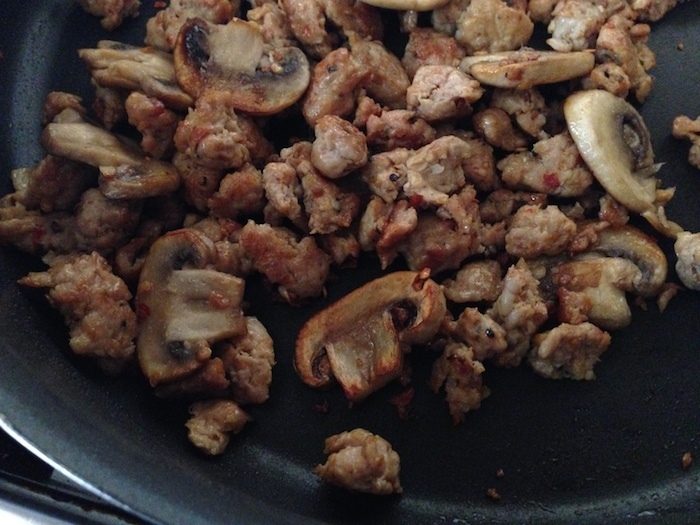 Seriously – this Pampered Chef pan browned the hell out of the mushrooms without a drop of oil added. Got a little crispy crusty thing going on. Check those things out! Step 3: Pour in a large jar of your favorite spaghetti sauce. God’s honest, I don’t remember what I used. Probably either Sockarooni or Tomato Basil. Just use one that’s not watery. Put the lid on and let it simmer while you do the zucchini noodles. 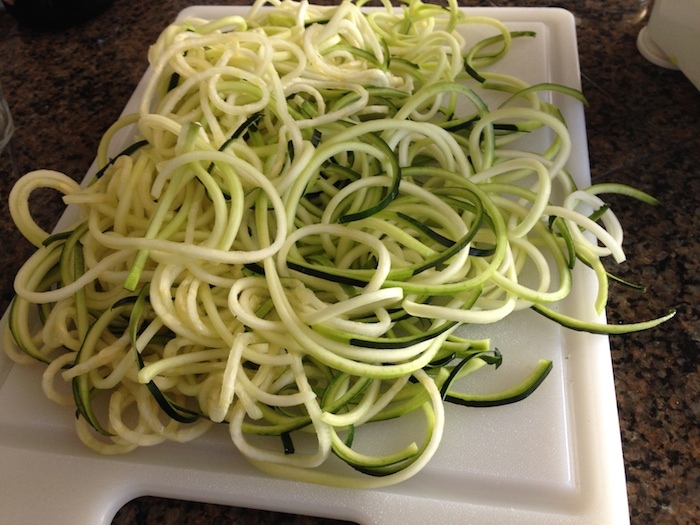 Step 4: Cut the ends off the zucchini, cut it in half, and run it through the spiralizer. The gal at Inspiralizer.com has short video instructions on how to do that. A word of advice: you’ll need a large, shallow bowl to catch your noodles in. I don’t happen to have one. Actually, I do, but I didn’t want to dust it off and dirty it up just for some zucchini noodles. I put my large cutting board under it. It was out already for cutting the ends off, so what the hell. Step 5: Heat a little olive oil in a pan and sauté some chopped garlic. I used the pre-chopped stuff from the store. Another sacrilege, I know. Ain’t no shame in my game. In this picture the garlic got a little too brown because I was trying to take a picture. Don’t let it get too brown or it will go bitter and weird. Oops! Step 6: Drop in your noodles and toss them around until they’re soft enough for you. I liked doing this separately because the zucchini will release some water and if you don’t get your sauce super dry, like the Inspiralizer lady says to, you’re going to water it down. Before cooking: it looks like a ton of noodles, doesn’t it? Zucchini releases water and shrinks down. This is why I recommend 1 zucchini per person if you’re going to cook it. Step 7: When you’re happy with the doneness of your zucchini, put it on a plate. Don’t let it go too long or it will get mushy. It will still be fairly firm no matter what you do to it. I divided the zucchini evenly between 2 plates. We were a couple of hungry, hungry hippos. Next time I might use 3 instead of 2. Step 8: Sauce on top of zucchini and, if you’re feeling fancy, a little grated parm, and you’re good to go. Fancy Schmancy! 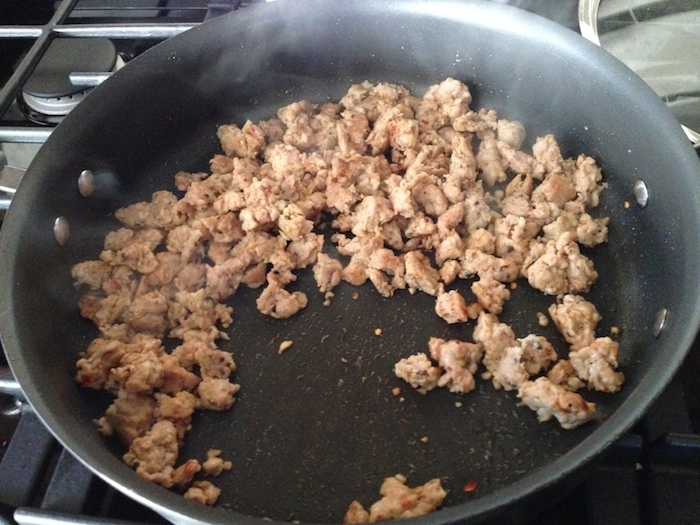 Brown sausage in a non-stick skillet over medium heat. If you don't have one, you'll need a little olive oil first. 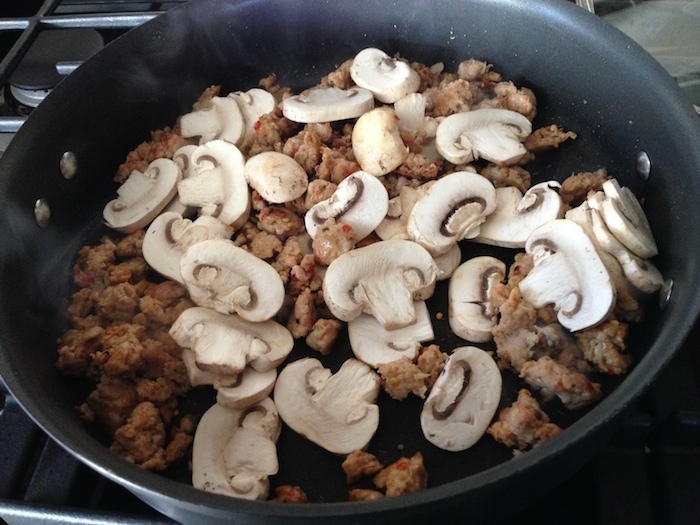 Add package of mushrooms and brown. 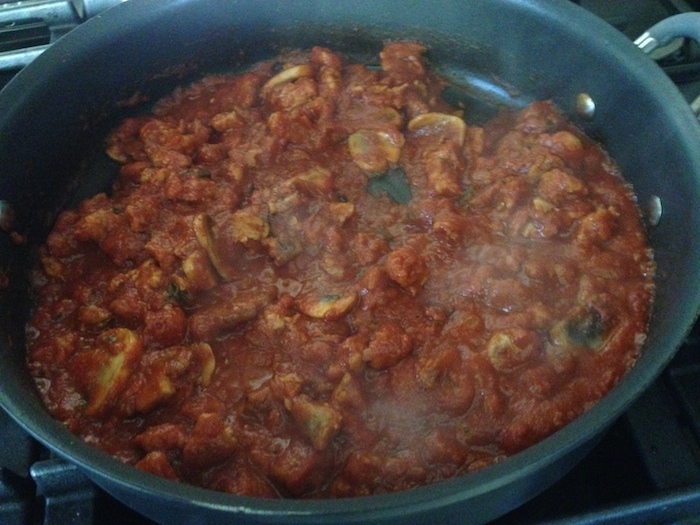 When mushrooms are done, pour in spaghetti sauce, stir, then reduce heat to low and let simmer until ready to serve. 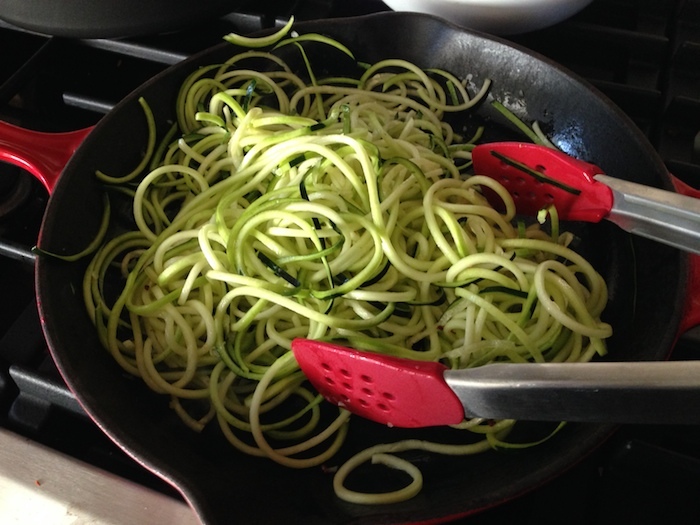 Run your zucchini through a spiralizer. Do this first so it's ready when the garlic is done. 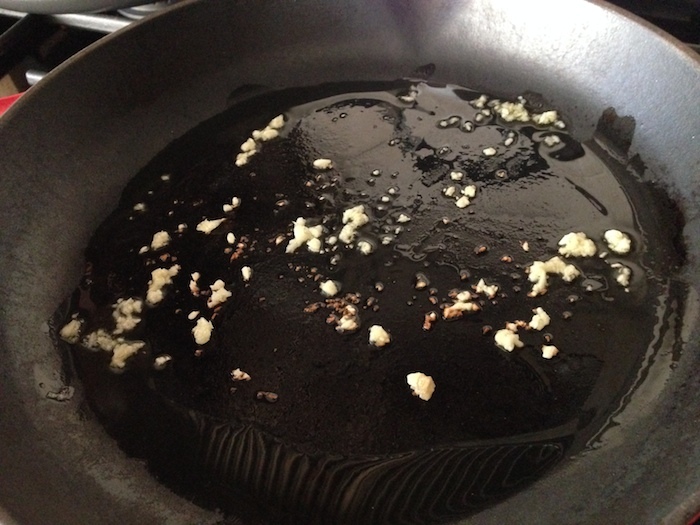 Heat olive oil in a skillet over medium heat and sauté garlic until golden. Toss zucchini with oil and garlic until the zucchini is as done as you want it. 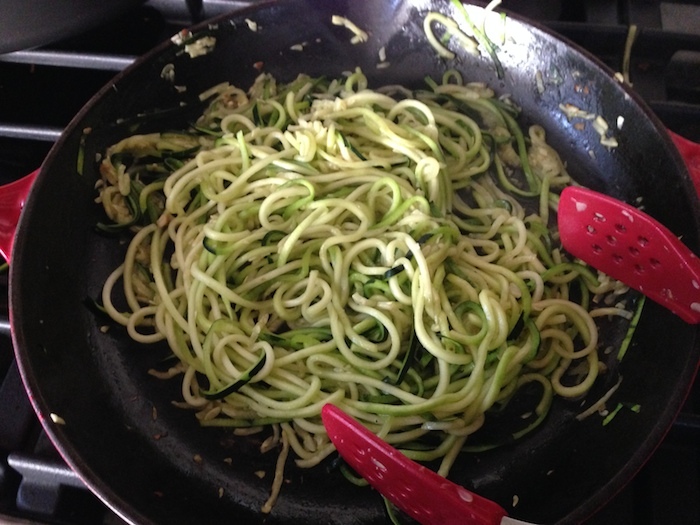 Pile the zucchini noodles on a plate, then pile sauce on top the noodles. Grate parmesan over the top or sprinkle some out of the green can. Whatever's easiest. Love Zucchini! Love your recipe. You are right to warn about having a dry/thick sauce. Learned that one the hard way. We’ve done wide slices of zucchini for lasagna. Also they make delicious cold salad noodles. Thank you for having a printable recipe at the end. That is my pet peeve. When the ingredients are all mixed in with the pics. Makes it very hard to follow. Hope you share your sweet potato recipe! And maybe explain this noodling & catfish connection?